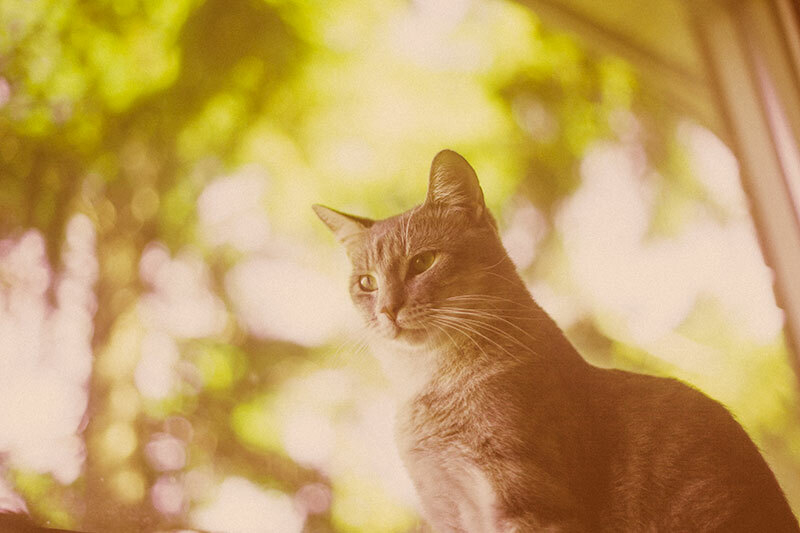 It can be more than a little difficult finding pet products cute enough to qualify as essentially decorative pieces for your home. 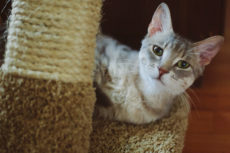 Cat furniture is especially frustrating on this front – as most cat trees and litter boxes available are either incredibly boring or go so far as to end up in ugly-to-look-at territory. I typically find myself fighting against this sorry state of affairs, digging and digging until I find a piece of cat furniture I actually love looking at and that really goes with my “human” furniture before adding to cart and checking out. 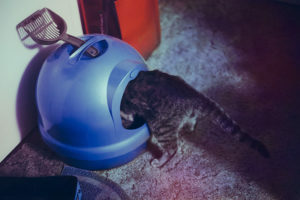 I ended up with the Modkat Litter Box this way, and to this day, that pretty little purchase is something I have not for a second come to regret. Having bought one piece of cat furniture I still adore looking at on a daily basis, I’m more inclined to do the same for future pieces. Having a cat tree/condo with leaves on it, or one that was designed to look like a real tree, was something I’d thought a lot about considering my obsession with English ivy used for interior decor. Obviously, I wouldn’t dare have real ivy hanging around a cat tree. 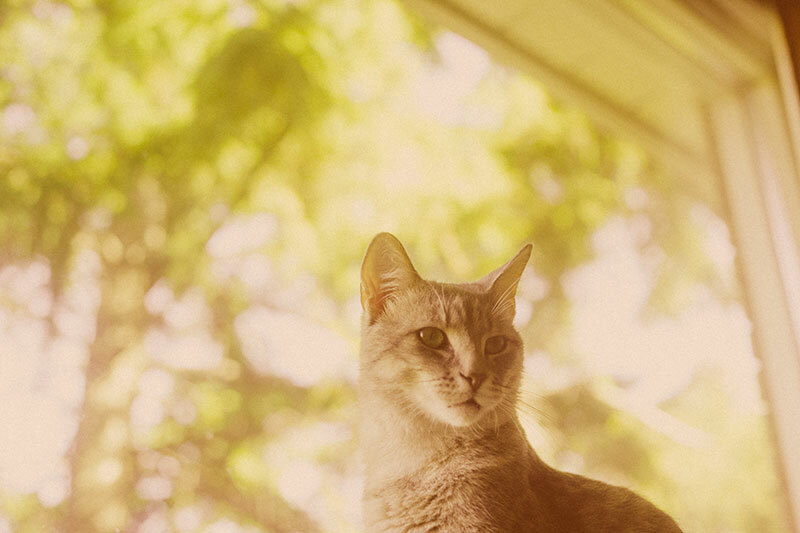 It’s toxic to cats and we all know how curious they can be about nibbling on house plants. The fake stuff these days can be pretty darn convincing, however, so the fact that I’d have to go fake never bothered me. And boy does a pop of green add some cheerfulness to a house. Always assumed the only way I could end up with a pretty little fake plant covered cat condo was to DIY the fake plants on myself, but I was wrong. There are actually quite a few cat trees that come with leaves already. They come in a bunch of different shapes and sizes, and heck, there are even cat shelves these days you can hang on a wall that will match nicely along with them. Go Pet Club F2096 Luxury Climber Cat Tree, 71"
I had to start here because I actually love this cat condo the most. 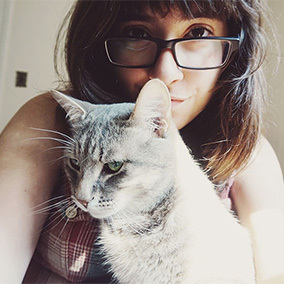 I featured it in my post on massive cat jungle gyms and keep coming back to it, thinking I’d really love to grab it when I finally move into a house. Personally, I feel it’s pretty gorgeous for a cat tree that’s covered in carpeting and scratching posts. Obviously, modern designs made entirely out of wood or bookshelf-looking ones out of plastic are much prettier to me, but I have a feeling Avery wouldn’t like them as much as something he can take his claws to every aspect of, like this. Because of it’s unique shape, colouring, and the not-too-overdone faux ivy, I think strikes a perfect balance between pretty enough for human eyes and excellent for a cat’s claws. What kitty could resist the boxy cat house in the center, or climbing up those posts along the top to get into that oh-so-cute looking nap-time hammock? A couple dangling ropes along the sides that kitty can play with also make this condo look reminiscent of a jungle theme. Too cool, and well pulled off in my opinion. My second favourite option is yet another Go Pet Club Cat Tree, though this time for completely different reasons from the first. Avery is an enormous fan of jumping, and really seems to prefer getting his exercise through this route rather than running or any other type of exercise. Something like this particular Go Pet Club Tree House would in my opinion strike his fancy way more than others, since there are ever so many platforms along both sides for him to leap onto. Obviously, he’d probably never touch that cute little ladder in the front, but I think it’s adorable so I like that it’s there. 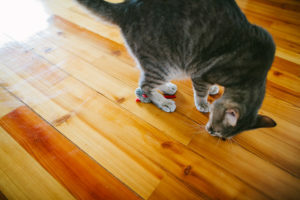 While this one’s a little less unique and interesting to look at as a human, I think my particular kitty would prefer it if I got him this one over the other – just down to his obsession with high jumps for fitness. Then there’s this On2Pets CatHaven Condo. I’ve never seen anything like it on the market before and it almost feels like Ripple Rug levels of could-be-considered-a-cat-toy pet furniture. Basically, in my head, products like the Ripple Rug and this condo right here are essentially hybrids between cat furniture and cat toys, since you know there’s going to be a lot of peeking out, grabbing, and overall playing going on around them. Imagine waving a feather toy outside this cat tree? There’s no way even the most lazy cat of all is not going to engage. Seeing little parts of the feather wand behind the fake leaves would be way too enticing. While it’s not an ordinary cat condo, therefore, and it’s not really a good replacement for a true cat tree, I think it’s got ridiculous potential for entertaining cats, again, same way the Ripple Rug would. Yes, this one probably crosses into cheesy territory visually – I doubt it looks very realistic in real life, but considering I could probably use it as a cat toy, I wouldn’t care. 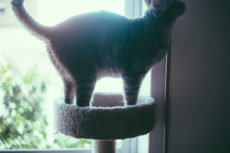 A lot of the products in this post turned out to be quite large, so if small cat trees like this are more up your alley, check out my article on small cat trees that pack a lot of punch for their size. This Kitty Mansions Cat Tree is all brown, making it look a bit more woodsy and like the cat tree house is an actual tree than the others showcased so far (#6 is also all-brown and very tree-looking). I almost feel like it’s a hybrid of the first two options, concentrating on the jungle/amazon aesthetic and wild look, on the hammocks, houses, and sleeping spots like the first Go Pet Club Tree House I showcased, and yet concentrating heavily on creating multiple levels for cats to jump like the second Go Pet Club Condo I featured. 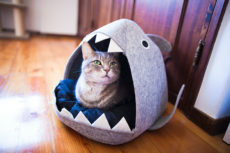 It’s pretty sturdy looking, and I feel would be wonderful for multi-cat households where cats don’t always get along, but have to share a condo. So this one’s interesting. 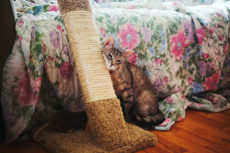 Instead of being covered in carpet, which we pet owners all know is pretty difficult to clean, this Cozy Cat Furniture cat tree house is covered in a soft plush that looks like carpet, but is apparently one heck of a lot easier to clean. 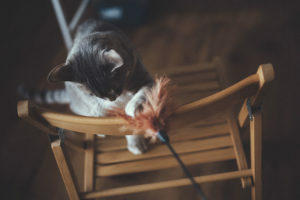 If you have issues with keeping a cat condo clean, say because your cat is anything like mine and leaps out of the litter box to his or her favourite spot and sits down without cleaning him or herself first – this might be your best option. Either way, it’s an excellent one to consider. Last one because I couldn’t resist – this stunning-in-white Go Pet Club Tree House. I’ve obviously showcased plenty of their products already, but if the Go Pet Club aesthetic is up your alley like it is mine, you might want to take a look around at the other options they have and choose the one you really like from the batch. There’s this white, covered-in-leaves option that looks like a taller version of this particular cat tree, and this circular, narrow leaf-covered cat tree that’s too cute for words and probably should have made it to my narrow cat trees for small apartments list. Okay, enough out of me. You get the picture, I love all the Go Pet Club cat trees. I’m done. Matching Cat Furniture with Leaves? Love the look of cat trees with leaves on them, and think it’d be cute to have extra cat furniture with leaves on them to match? 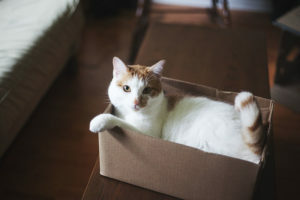 Good Pet Stuff’s Hidden Cat Litter Box fits this bill perfectly. 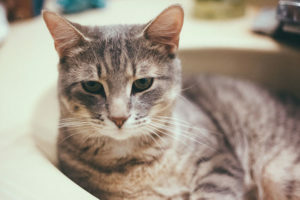 It’s a hidden litter box in the shape of a house plant – the flower pot portion being where your cat uses the restroom, and the gorgeous fake plant topping off the finished look. Really like the idea of grabbing a hidden litter box, but this one just not doing it for you? 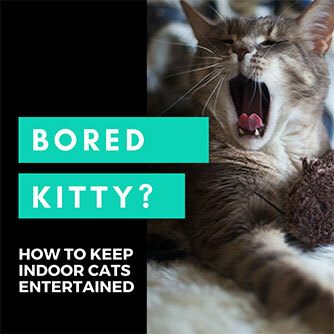 Have a peek at my current favourite hidden cat litter boxes here. 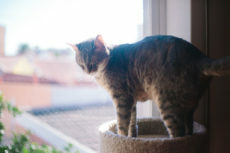 Remember the On2Pets Cat Condo from spot #3? The same company also makes matching leafy canopy shelves that would go well with absolutely any tree-looking cat tree on this list. If you like both the cat condo and the shelves by On2Pets, there’s a two shelf + cat condo combo available that seems to be a lot more affordable than buying the pieces individually. What Do You Think of Cat Trees Covered in Leaves? Do you like the whole covered-in-leaves aesthetic when it comes to cat trees, condos, and shelves? What do you think of the small cat condo from #3? 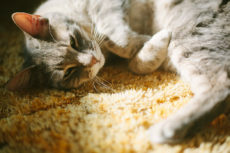 Do you feel it might double well as cat furniture + cat toy like the Ripple Rug? Or do you think most cats would simply snooze in it and not actually care to go after toys peeking through during playtime? Would love to hear any thoughts you have on this topic in the comments! I came across some amazing cat “trees” at http://www.ahiddenhollow.com. I can’t afford one of them yet — they are like fairy tale cat trees straight out of Disney movies. Maybe someday…. Check them out though. They are exquisite! Wow they’re gorgeous. 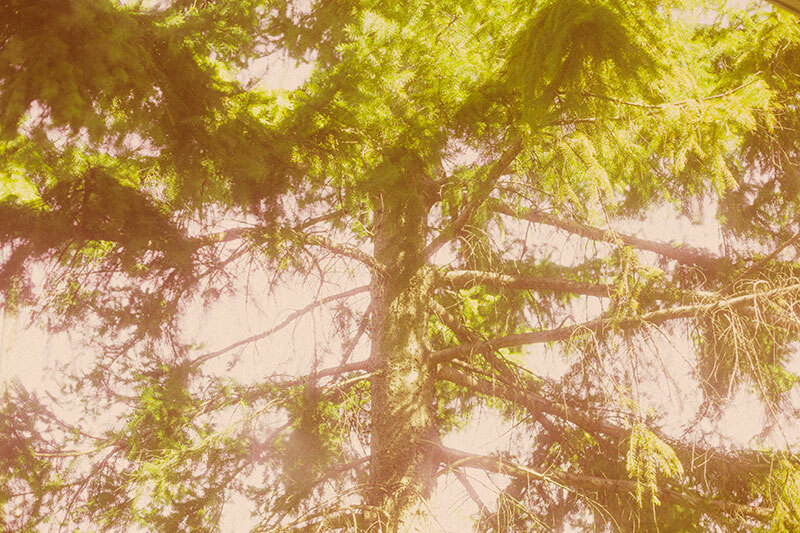 Thank you for sharing – these are too, too cute, and really do look like trees – I love that! These all look great. We just have cheap poles from Walmart. Whatever does the trick! I wish Avery would use regular scratching poles but he seems to only like the slanted ones. I think it’s a matter of him being too tall to stretch on a regular pole, but not quite sure. Interesting! There are more options than I would have thought of! We need more climby things for Manny and DB, but they are HARD on the house, since they race around and up and down and tackle each other and fight, rolling and squawking. Angel, however, would enjoy hiding behind leaves. Thanks!